Last week whilst visiting my parents, my mum gave me some unexpected news. Brace yourselves for this one. It’s a bombshell. 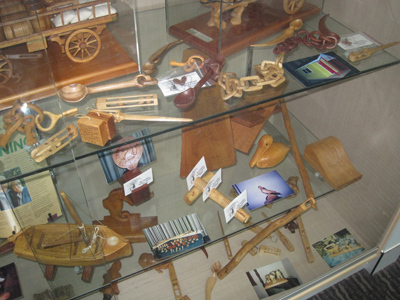 My mum informed me that their local library is currently holding… are you ready for this?… a whittling exhibition! Seriously, what are the odds of that? Soon after I declare myself to be the World’s Leading Authority on Carrot Whittling (to any new visitors, please read this post and it will all make sense), there is a whittling exhibition IN MY HOME TOWN! Straight up I have to ask the burning question: why didn’t they ask me to submit my whittled carrot? WHY? I am the critically-ignored Carrot Whittler Extraordinaire to the Stars. And yet I have been publicly snubbed by both the whittling community AND my own townsfolk? No, it was an outrage! Perhaps they’ve never heard of me, but that sounds unlikely. I mean, how on earth could a small town librarian NOT have heard of a Sydney mum who once whittling a carrot into a TV remote control in an effort to get her infant to eat it? No, the only possible explanation is that they can’t handle my non-traditional use of a carrot instead of wood. Purist bastards! Anyway, I wasn’t going to take this lying down. I decided to fight back for the sake of carrot whittlers everywhere (which is really just me, let’s be honest, but I am a very vocal minority). Come hell or high water, I was going to get my carrot into that damn exhibition. And so began Operation Whit-less! Very soon into the mission, I encountered my first problem. And it was a doozy as far as problems go. I had nothing to exhibit. My whittled carrot no longer existed because my husband ate it. However, I did have a photo of the carrot on my computer. So I added a wooden frame effect in Photoshop (to make it look exhibition-worthy) and printed it out. That wooden frame is pretty convincing, hey? You’d need to be some sort of frame specialist to notice that isn’t real. Anyway, my sister came over and was more than happy to help with the “sting”. We decided to slink (oh yes, slink) into the library, hang my picture amongst the artworks, get video evidence, and quickly leave. The word “stealth-like” was bandied about quite a bit. 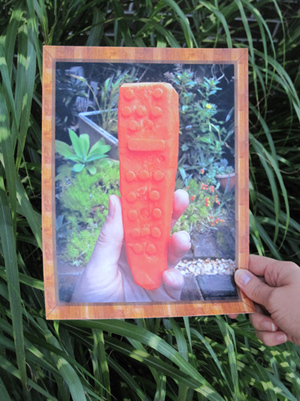 So we grabbed the photo, a wad of bluetack, a camera, and set off to the library. During the drive there was naturally only one thing to discuss: what our code names should be. I have previously referred to my sister as Kurdles in this blog but as we approached the library she threw a spanner in the works. “I’m not happy with my code name,” she said. “I know we’re nearly there but we need to stop and discuss mine”. So we did. We pulled into the library’s carpark and sat there debating a suitable replacement. Why did I say “shush”? Well, just in case there were librarian spies hiding in the carpark, poised and ready for such a whittling-related sting. DUR! Once we finally entered the building, the beleaguered Operation Whit-less encountered yet another challenge. You see, the ‘Whittling Exhibition’ wasn’t so much an exhibition, as a cabinet. A glass cabinet with locked doors. Shootin’ Tex and I just stood in front of it trying to comprehend this latest hurdle. “How the bloody hell am I going to get my photo in there?” I eventually asked. Before my sister could answer, an old lady suddenly appeared at my elbow. I jumped slightly. She was holding a home-made folder. Bizarrely, it had pictures of quilts that she apparently wanted me to admire. But remembering that we were supposed to be “stealth-like”, I kept quiet and nodded nicely. The sweet old lady left as mysteriously as she arrived and Shootin’ Tex and I were again faced with our dilemma. How were we going to get my picture into the cabinet? By this stage we had been standing there for about 10 minutes. The staff were beginning to notice. I can see why. Here were two 30-something women taking photos of a cabinet of wooden carvings, whispering to themselves and looking guilty. I decided smashing the glass may not qualify as being particularly “stealth-like”, so I had no choice but to just prop the photo against the cabinet. My sister filmed the ‘sting’. Watch the video below. And it was. Mission accomplished! They are sneaky. I should have gotten her in a head lock, before doing a commando roll outta there! I have never been more proud of you than I am right at this minute! Thanks CH! It was a victory for all the little people out with stupid hobbies, who call themselves experts with nothing to support this, but still UNBELIEVABLY get ignored by local rural libraries. I speak for all of them. I’m suprised you could get that close to the ‘cabinet’ – let me know when the quilting exhibition is on. I suspect the armoured guards were on their morning-tea break. I am going to enlist my mum’s hitherto under-utilised espionage skills and have her go to the library to see if the picture is still there. My hope is that some well-meaning librarian spotted the photo propped sadly against the cabinet, thought, “Oh, it must have fallen out”, and “replaced” it alongside them, quite frankly, dull other whittled objects. Before you send your mum, it’s vitally important that she gets a code name. How about Dr Checkup? Or the Whittle Skittler? Ideas?? How about “The Ghost Who Whittles”? Can you tell your mum that if she’s captured – you know, by the librarians – to deny everything. And avoid the strange quilt lady who may or may not be a secret agent. God speed and goodluck, TGWW! Well… All I’m gonna say is thanks. Thanks for nothing. Thanks for not inviting us DIEHARD FOAS fans along to witness the action. The least u could have done is stream a live podcast yes? but no, fame has run away with u and u have left your fans behind. I HOPE PRIDE COMETH BEFORE A FALL! You make some good points. But I don’t think a live podcast is enough. I need my own tv channel, like Oprah. FOAS TV! 24hours a day of carrot whittling, dubious parenting advice, and watching the back of my head. Ratings winner! Someone pass me the whisky ice-cream…. And hold the ice-cream while u are at it! Is this a subtle request for me to whittle you a spoon?